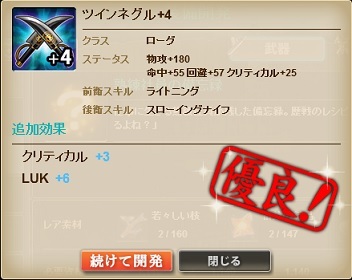 It appears the +4 weapons don't do the damage that even +3 Labyrinth weapons do. I'm not sure about their abilities. On the other hand, the three additional stats from the rainbow craft are all reasonably useful to a rogue. From the name and the corporate thing I can't help but think of the weapon as: "Twin Nagel"
Don't know where to ask, so I'll do it here. How I can craft seasonal weapons? (specifically this event's ones) Where I can get the recipe for them (please not medium difficulty, I cannot survive medium as I do not have any 5* employee yet) and do these last more than just the duration of the event? 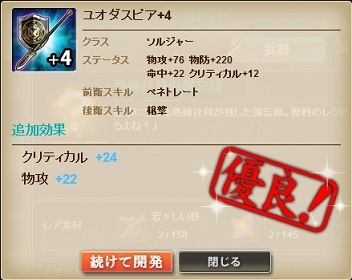 if you clear the event's 1st quest you will get the junior recipe.. if you clear the event's 2nd Quest, you will get the skilled recipe..
i can still clear the intermediate level without any 5* employee.. i use monique(lv30) and azamino(lv30) with 2 clerics(lv 30) Aselia (lv37).. you just need better equipment i think..
.. .. now i kinda feel bad after saying that.. don't give up, dude..
Whoa, this is rare for RNG being quite generous to me.